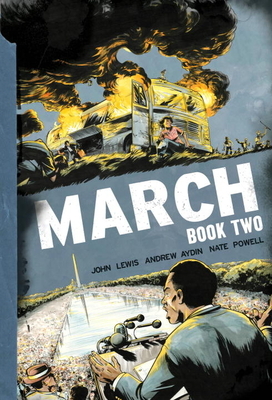 Congressman John Lewis, an American icon and one of the key figures of the civil rights movement, continues his award-winning graphic novel trilogy with co-writer Andrew Aydin and artist Nate Powell, inspired by a 1950s comic book that helped prepare his own generation to join the struggle. Now, March brings the lessons of history to vivid life for a new generation, urgently relevant for today's world. After the success of the Nashville sit-in campaign, John Lewis is more committed than ever to changing the world through nonviolence - but as he and his fellow Freedom Riders board a bus into the vicious heart of the deep south, they will be tested like never before. Faced with beatings, police brutality, imprisonment, arson, and even murder, the movement's young activists place their lives on the line while internal conflicts threaten to tear them apart. But their courage will attract the notice of powerful allies, from Martin Luther King, Jr. to Attorney General Robert F. Kennedy... and once Lewis is elected chairman of the Student Nonviolent Coordinating Committee, this 23-year-old will be thrust into the national spotlight, becoming one of the "Big Six" leaders of the civil rights movement and a central figure in the landmark 1963 March on Washington for Jobs and Freedom.